CAPTION: "Pictures courtesy of Free Nature Photos." Scientists have found that animals are communicating with one another often. Actually, almost all the time! Elephants have their special language of communication as well. Elephants communicate with sounds, touch and movement (body language). For instance, when a elephant is shaking its head from side to side and slapping its ears back and forth against the sides of its face, it may mean it is annoyed. When angry an elephant may kick dust, flap her ears and lower her head as if to charge. This is called a mock charge. When elephants are excited and/or want to play they tend to flap their ears. They may also pile up on each other. Elephants also use touch (leaning on each other, touching each other with their trunks or feet) to express affection and to make sure that young ones are close by and safe. Elephants may not have words but they do have their way of definitely communicating with others. They even have sounds that they make such as songs and rumble noises. Some of their sounds that they make cannot be heard by human ears but can be heard by fellow elephants. 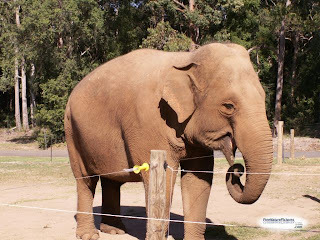 To find our more about about elephant talk go to http://www.elephantvoices.org/. However, I noticed that the link to Free Nature Pictures is broken. It has an extra http in the URL. Would you do me a huge favor and fix the link? The link should be fixed. Thanks!